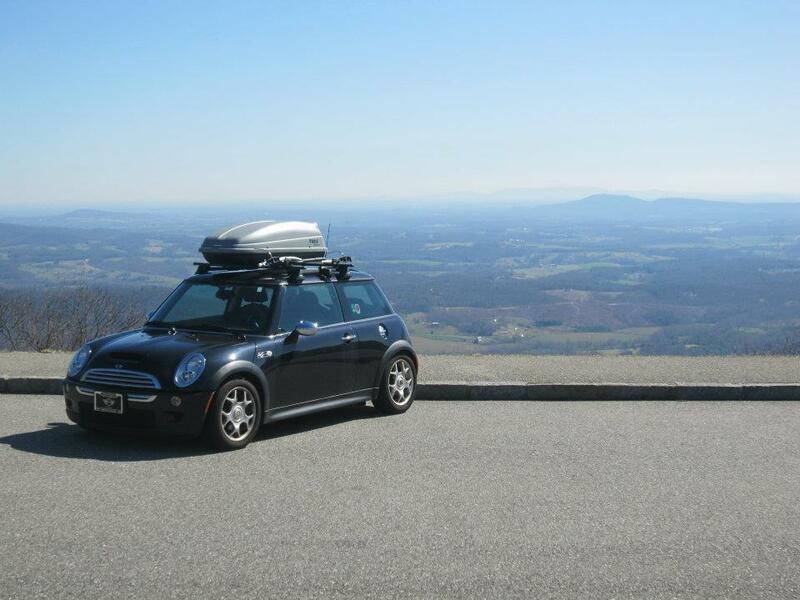 The sun is out, the air is clear, and the windows of my six-speed Mini are down as I snake around the turns of the winding road by the Ohio River. On the third day of my recent visit home to Louisville, I took a drive, about an hour long, out to Middletown and down the Gene Snyder to River Road. There are few things I miss more about living in Louisville than driving. I don’t really feel at home until I’m ramping up to fifth gear and speeding off through the I-64 tunnel. There’s something about driving for me that’s reflective, spiritual even. A hand on the wheel flicks a switch in my brain that tells me to stop, breathe deep, and stop freaking out. I am an introvert. I like time to myself; as a textbook INFJ, it’s really more of a need than a want. I think it stems from growing up as an only child and having so much me-time (latchkey kids for the win). As I grew older and sports, quick recall, etc. invaded my life, those essential moments became fewer and farther between. So after I turned sixteen and passed my driver’s test, my car and the road became the place where I could reflect, recharge, and sometimes even break down. There’s something about the constant motion that gives me emotional freedom, allowing me to laugh, cry, and sing at the top of my lungs free from judgment (sometimes all three at once: I’m looking at you, “Next to Normal” cast recording on my shuffle). Moving to New York, with its miles of subways and lack of parking, has deprived me of this safe place. Neville (yes, that is his name. And yes, he’s named after this one) and I have traveled a long and winding road together: my little portable piece of home. His tires have traced the highways to Baltimore and back three times, his speakers blared the soundtrack to a spring break road trip down the Blue Ridge Parkway, his windows have seen every stretch of I-65 between Chicago and Nashville, and his grey leather seats were my secret college getaway when I needed a moment’s peace that couldn’t be found in the library. So what’s an INFJ to do in a place where having a car just piles on the headaches rather than being a solace from them? The subway’s not the same. Maybe once a month you’ll get a seat that doesn’t have you squished between two people, one of whom probably hasn’t showered in four or five days. More often than not you’re playing pole Twister, snaking over strangers’ arms and around backpacks to try to find a patch of silver that isn’t still warm from a fellow commuter. Taking the train, I’m not in control. I can’t stop or start when I wish. I’m subject to the whims of MTA (whose whims are anything but whimsical). Instead, I walk. A lot. New York is a pedestrian’s city — unlike the suburbia of my youth, these streets were made for walkin’ — and because of the neighborhoods I’ve lived in, my walking everywhere started as a more convenient alternative to public transit (MTA hates Brooklyn). But what was simply a means to avoid three transfers is now something I look forward to. I put on my headphones, step out my front door, and I am in control — of where I turn, which way I go, the soundtrack to my day. Even in this city of rampant pedestrians, my walking game is notably strong. It’s approximately 3.5 miles from my front door to the Brooklyn Museum, where I work, and depending on the weather (and my success or lack thereof at hearing my alarm), I try to walk there and back each day. I make a point of taking different turns, seeing brownstones I haven’t seen before, noticing a mural that wasn’t there last week. Sure, it’s a way to better get to know my hood, and a source of endless free entertainment, but mostly I walk because it gives me the personal agency that public transit cannot. The hour and fifteen minutes I spend walking through the crisp morning air are my car time: An iPhone and headphones replace my radio, my well-soled Frye’s are the comforting leather seats, and my backpack acts as glove compartment and center console (one pocket filled with the things I need easy access to, the other filled with the junk that I always have “just in case”). It’s all the freedom of my car, but at a slower pace and from a different angle. 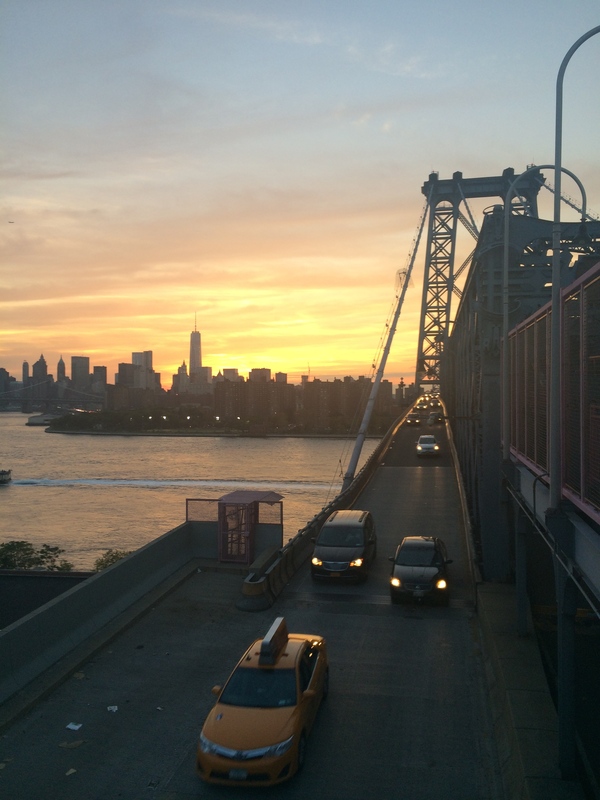 Sunset on the Williamsburg Bridge after walking across Manhattan. Previous Post Previous post: October Playlist: Drizzly Morning, 3 a.m.
What I like about walking too is that as opposed to driving or taking public transit, you can accurately predict how long it will take you to get to your destination. I love walking, and city walking is something I would miss if I moved back to the suburbs. But yes, every time I go home to Jersey, I am reminded that there is a freedom in driving with the music on and the windows down as the wind rushes toward you. And– you don’t have to carry your groceries home.